The Council and members of the Australian Dental Association Victorian Branch Inc. have much pleasure in presenting to Dr Barry Creighton BDS (Sydney), Grad. Dip. 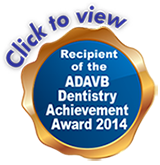 In Clinical Dentistry (Conscious Sedation and Pain Control) the Dentistry Achievement Award in recognition of special service to dentistry. 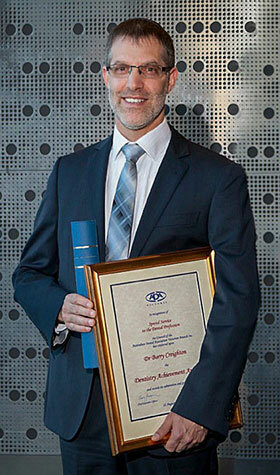 Dr Creighton has made a significant contribution to the profession of dentistry, particularly in the area of the promotion of dental health, as well as community service. He provides a unique service that allows fearful and phobic patients to address their dental needs. Regarding his community service, Dr Creighton is a volunteer medical emergency first response paramedic, providing medical emergency services. Dr Creighton graduated from dentistry in 1992. In 2003, Dr Creighton developed chronic regional pain syndrome of the right hand, wrist and arm. After three-and-a-half years of rehabilitation and practicing at the Melbourne Dental School, Dr Creighton was able to return to dentistry part time. Dr Creighton then re-trained so that he could provide conscious sedation and pain control for people who avoid dental treatment due to anxiety and fear. His mobile IV sedation service delivers care to anxious patients anywhere. Dr Creighton has helped more than 500 patients get the dental care they otherwise would avoid. He is a member of Hatzolah, a volunteer organisation which attends medical emergencies and is recognised by Ambulance Victoria. Barry has saved those suffering from cardiac arrest, successfully resuscitated a drowned child and has delivered two children. It is fitting with such special service to dentistry that Dr Barry Creighton is a recipient of the Branch’s Dentistry Achievement Award.